Most businesses view their website as a sales tool, which understandably leads to the idea that all content should reference product value. It’s a common mistake to place products at the forefront of every article or blog post. The conclusion we’ve come to on this subject: If the sole focus of your corporate blog is to talk about your products, you’re going to find not many people will be interested in what you have to say. But people can be sold on your brand’s value beyond service offerings. Here’s an example: One Brafton client in the IT management space came to Brafton in an effort to increase lead generation. The brand was in a “boring” industry. It needed assistance generating leads and garnering interest around their products. We knew we needed to reference products, but placed the focus on education and questions to appeal to buyers’ interest. Topics included how-to tips, with the provider’s offerings as one viable solution, alongside other ideas readers might enact right away. Blogs around 400-words in length provided just the right amount of word space to give a useful tip for people who might benefit from company’s offering. 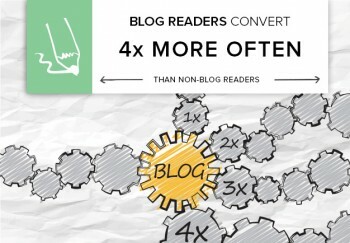 People who read the blog are actually four times more likely to convert than those who don’t read it. Even though the rest of the website is dedicated to landing pages about products and services – the blog posts with tips and advice – get the most traction. In order to attract readers in the first place, our writers needed to understand the demographic they’re speaking to. In this case, it was data center managers. Next, we set out to create a balance of educational and promotional articles (much heavier on the former). When we started publishing blog and news articles that provided tips and advice for data center managers, they were more interested in learning about the products. The blogs helped contextualize the brand’s offering as a solution to a larger pain point. An educational blog also earns trust. Actionable takeaways and real-life advice show readers the blog is set up as a resource for them, not just as a sales tool. But one CTA is not enough. Your blog calls to action should consider the subject matter of the post, or the specific action a reader is most likely to take. In this brand’s situation, they created a CTA button that had three different options – view a video, download a free trial or contact a representative. For this company, 87 percent of blog readers represent new monthly users. Yes: Every headline was optimized for search – it’s good to keep the top of funnel wide. But no: Not all of this “new traffic” had landed via a blog. It comes down to good integration, ensuring that when a new person arrives on the site, the educational value of the brand is part of his or her first impression. You need a clearly stated blog and resource center in the navigation bar at the top of the homepage. It gives new visitors who might not be ready to buy a place to go, while also ensuring to them that the website isn’t just a brochure. We’ve said it before: When someone enters your website for the first time, it’s a bit like a blind date. No one wants to sit across from the person who only talks about him or herself.